Life moves in circles, and old music comes back into fashion. Because of the current ‘random rap’ trend a lot of forgotten or overlooked rap records from the ’80s and ’90s enjoy a second life. One of those lost gems is ‘Dope Material’ by rapper Dose Material. 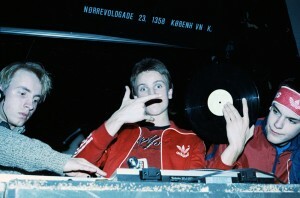 The song, recently featured on a DJ Muro mix-CD, was originally released in 1988 on the NYC indie label Cutting Records and produced by Danish DJ and producer Jørgen ‘TNT’ Møller. In the following we’ll hear from TNT about making a ‘random rap’ rarity, being one of Denmark’s first official Hip Hop beatmakers and his opinions on club music. Thanks for talking to us. I’m a big fan of your record ‘Dope Material’, which to me is one of the best Danish-produced Hip Hop records ever. You’re absolutely welcome! I am pleasantly surprised to learn, that people even know about that record. Many excellent Hip Hop producers have come out of Denmark, so it is a great honour for me to be regarded as part of the upper echelons of that posse, and I am elated to know, that my output has actually reached and touched somebody. Are you aware, that Hip Hop collectors are looking for that 12”, and that the test pressing has sold for 49$ online within the last 3 years? I remember the song, from when it came out in 1988, and in 2003 it was featured on DJ Muro and DJ K-Prince’s mix-CD ‘WKOD 11154 FM – The Golden era of Hiphop’ in good company with Raw Dope Posse, BDP and Todd Terry to name a few. Did you hear about that? What’s it like having a record, that’s part of a sorta revival some 20 odd years later? It’s one of those things, isn’t it? And for that to be defined as belonging to the golden era of Hip Hop and played alongside BDP, Todd Terry etc. is even more baffling! You won’t find many records much more obscure than that one. I never even heard of that CD, and I have no knowledge of the fact, that the record has attained that status, so it is extremely flattering! I am quite honoured being able to give back to Hip Hop something of value. After all, I have been an avid fan since 1981. How did the record come together? How did you get in contact with rapper Dose Material, and how did you get the record released on Cutting Records? It’s a bit of a story. At that time, late ’88, I was working in both clubs and on radio in Denmark. I was already into key mixing, reel-to-reel editing and 4-track remixing back then, and that naturally evolved into making tracks, even if it was just for the sake of it. There was no deeper meaning behind making that track, and I didn’t really expect it to go anywhere. I had spent a lot of time in NYC looking for vinyl for my DJ sets and mixes, and at some point I got to meet with Aldo (Marin, owner and manager of Cutting Records) at his brother’s recordshop (The Music House). Aldo soon after took me over to Cutting Records’ office up in Washington Heights, where he lived. He even invited me over to his apartment and showed me his old reel-to reel tape recorder, on which he made some groundbreaking mixes and edits for the legendary radio station WKTU. In fact, Aldo’s mixes definitely had a part in inspiring me to pursue that path, and it was awesome to meet him back then. He was very friendly and introduced me to a lot of great people and artists. As my relationship with Aldo deepened, we started talking about me using my mixing skills to start producing tracks. During one meeting, I played to him what I had come up with (the instrumental for what would become Dope Material). He loved the track, especially, and wanted to put it out with Dose rapping on it. Not a bad idea, it seems! When you made the song in 1988, Hip Hop producers were moving from a hard drum machine sound to a smoother sound using Funk and Jazz samples. The song combines the two styles; a heavy drum machine track with Jazz and Funk samples – the Stanley Turrentine’s ‘Sister Sanctified’ drums, also used for BDP’s ‘My Philosophy’, and the Funk Inc. ‘Kool is back’ guitar riff – making for a pretty slick sound. How did you come up with that sound, being it was your first record? Was it a conscious choice to mix the two styles? I loved the tracks, that contained those breaks, and I had been cutting up a selection of breakbeats for quite a while at Copenhagen’s premier Hip Hop club Thomas P. Hejle. During my search for breakbeats I’d stumbled upon those. In time I grew to love them, and it was an obvious choice for me to take the cool parts of those tracks to use on my own track. There’s also an energetic percussion breakdown in the middle of the song. Was that inspired by Electro or Freestyle/Latin Hip Hop? Did you program that or play it live? The percussion breakdown was inspired by both the Washington DC GoGo sound as well as the authentic Latin sound, I’d hear in New York, when I’d be cruising the streets of Manhattan in my constant search for vinyl outlets. I programmed the section on the Roland 727, which was one of the few percussion units around at the time. It’s a pretty widespread rumour – at least in Denmark – that you actually made the beat and produced the song, even though the production is credited to Aldo Marin and Rafael Vargas, and you’re only credited with ”Special thanks to TNT” and composer credit in parentheses together with Aldo Marin as ”Y. Moller”. What really happened? Yeah, I made the track on my 4-track Fostex back in Copenhagen and handed over the master on a cassette. No kidding! This was before DAT and WAV files really came into existence! Aldo loved the track and was sure it could become a decent Hip Hop track. He later transferred it to reel, edited it and got it on to his 24-track at the Cutting Records studio, so he could layer Dose’s rap on top. Which equipment did you use making the song? Did you teach yourself, or did you get help from other producers? Were the current US producers like Marley Marl, 45 King, Bomb Squad and Mantronix an inspiration? How about the Electro, Freestyle/Latin Hip Hop and House producers like Todd Terry? Back then there wasn’t any Internet, so you couldn’t google stuff, and there was no real media to get clues from, so everything was basically self-taught through a trial-error process. Of course, those of us that had progressed to that level, would exchange experiences and thus learn from each other. I would be striving to achieve a certain sound and somehow figure out to get it from the small selection of studio gear I had access to. I remember owning a stack of hardware gear, including a Roland MC 500 sequencer, an Emax sampler, a Roland 707 and a Roland 808 (drum machines), which I’d use to trigger two digital delays, which each had a simple hold-function, so they were assigned as really crude, very low bit-rate samplers without any audio processing options whatsoever. It was an extremely crude setup, but I somehow got it to work. Through my network I got access to an 8-track studio at some point, and further on I’d also get into reel-to-reel editing, when I started doing radio mixshows. I managed to take that to a level decent enough to even win the praise of the Latin Rascals (legendary team of engineers known for sharp edits). My productivity kicked into overdrive, when I got hold of the Akai MPC 60, which was a really amazing sequencer with a great quantize feeling and gritty sound. That, the Juno 106 and a Korg rack unit all routed through a Mackie mixer was the simple setup, which I (later) used to produce pretty much all of my house tracks. We didn’t hear more from Dose Material after that. What happened with that situation? Please tell us, you recorded a full album just waiting to be released! If only that was so! With so many years having passed, so much water under the bridge, Dose must have gone through some very interesting moments to reflect on, and surely he’d be able to turn that into awesome rhymes. Any interesting war stories from working with Cutting Records in New York? I have fond memories of my times with the good people at Cutting, and it was actually a rather peaceful period in my life. There were some very late night sessions at the Cutting Records studio up in Washington Heights at Vermilya Avenue with the Allen Street Crew – Oscar Poche etc. – where I’d have to get on the New York subway at the Dyckman St. station – the stop before 207th Street – around 4-5 AM for a trip all the way downtown to 4th Street. That trip would always be interesting, because of the characters that would be boarding and alighting along the way, especially as we would pass through Harlem on the way down. Interestingly enough, I never felt insecure at any point during my many times in NYC. It was great later having the honour of getting to work with Terry Burrus on the Rochelle Fleming track ‘Danger’, getting introduced to legends such as Lil Louie Vega, Kenny Dope (from Masters At Work), Afrika Bambaataa, The Wiz Kid (of G.L.O.B.E and the Wiz Kid fame), Roger Pauletta, 2 in a Room and meeting and hanging out with Jazzy Jay and many, many more. There were also some weird incidents such as the one time, where one of my tracks ended up on a Todd Terry EP, which was sub-licensed to a German label. I remember going through the tracks and having the most persistent case of déjà vu, when I put the needle to the last track on the EP. As I was listening, I knew exactly, how the next bar and the next section would sound, so I checked the label, and yup, that was my track on that Todd Terry EP! How weird is that? I forgot the name of the track long ago, but remember that it was based on the bassline from Chaka Khan’s ‘I’m Every Woman’, which I had sped up by 1 semitone. The title totally escapes me ‘til this day, and I haven’t been able to track it down. Other tracks, I produced in that same period, also mysteriously found their way onto records without me being credited for it other than my Klubhead alias ‘The Allen Street Unreleased Project Volume 2′ – ‘Feel The Melody’ (Original Klubhead Mix) is a case in point. Let’s jump back in time: How did you first get into Hip Hop, DJ’ing and making music? Well, it all began back in 1982 for me, when I was getting into genres, that were considered underground at the time. That would include Hip Hop, Electro, Funk and Soul. I had actually been a fan of the Glam Rock scene and early Punk since my pre-teen years. The reason, I got into DJ’ing, was mostly to bring a more interesting repertoire to the youth clubs, that I attended. At the time the resident DJ at my main hang-out would be playing such horrid tracks as Dire Straits’ ‘Sultans of Swing’. Seriously, I’m not making this up, it was that horrible! The audience didn’t really have enough musical knowledge to pass any type of sensible judgment on what, they were being forcefed, so I took it upon myself to educate them. At the time I was into a cross-section of what, I’d call ‘New York Urban’: You know, if you look at the Billboard charts of the early ‘80s, any genre that couldn’t be defined as belonging to either Rock or Pop, was categorized as ‘Urban Contemporary’, and that broad-stroke labelling included Disco, Latin Freestyle, Electro and Hip Hop, as well as R’N’B, and even Funk and Soul. The strong borders, that would later define most genres, did not really exist for me, and I would play a big melting pot of styles in my DJ sets. Looking back at my favourite tracks at the time, I realize, it is oddly similar to the repertoire of, what went down at The Paradise Garage (legendary club) in New York. And that was without having much knowledge of the place at that time. Over time I progressed to working in both clubs and on radio in Denmark. Generally it sucked to be a club DJ in Denmark back then, though, because you would always have mainstream punters come up to the booth to request this terrible top 10 MOR (middle of the road) stuff, they would listen to on day-radio. It was way more fun to play on radio, because I could play whatever I wanted, without having to worry about taking the listeners out of their comfort zones. Besides, the MOR repertoire didn’t work very well in a mixing context, and for me it was always about the mix and keeping the beat going! My focus as a DJ centered on the execution of flawless mixes, while bringing something new to the table. I didn’t really consider the audience’s feelings at the time. Only later in my DJ career, when the audience had become accustomed to House etc., would I cater directly to the dancefloor. It was of primary importance to me to make slamming mixes, and hopefully that would indoctrinate a few heads along the way. By the late ‘80s I was already into key mixing, reel-to-reel editing and 4-track remixing, so I would always have something special to offer my audience. How did you get the name TNT? I read somewhere, it was because, you started mixing Hip Hop beats with Rock records. Was this before Run-DMC and Beastie Boys? Yes, I took the name, as I’d already started fusing sections of tracks from Rock groups such as AC/DC with Hip Hop, and as you may know AC/DC had a track called ‘TNT’. The Billy Squier track ‘Big Beat’, Thin Lizzy’s ‘Johnny The Fox’ and so on were always part of my breakbeat cut-up sections. This was quite some time before Beastie Boys’ hybrid really hit the mainstream. 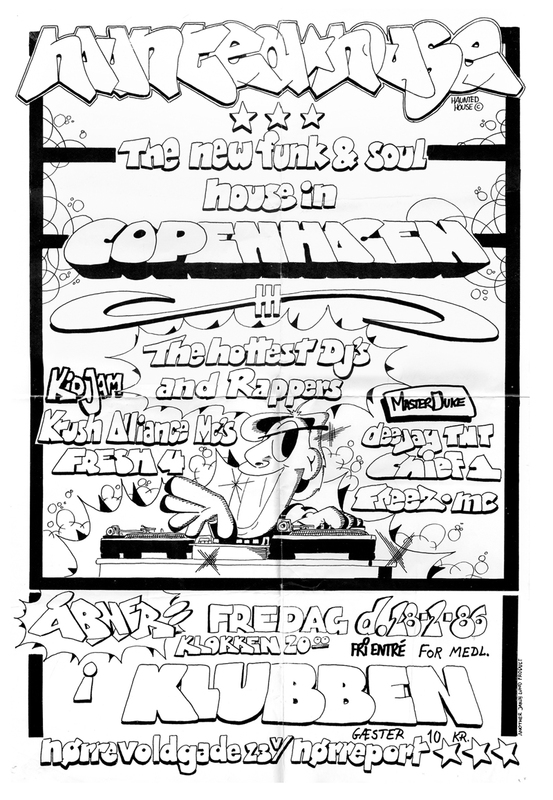 Around 1984 the Hip Hop movement in Copenhagen had grown quite substantial, and at some point we got in contact with the club Thomas P. Hejle, with whom we were able to negotiate a deal, which essentially gave us a weekly non-profit club night there. Thomas P. Hejle was basically a youth center, which hosted a club night on Fridays in their downstairs room, but we were actually allowed to use a huge upstairs room for our shenanigans. Here the breakdancers and graffiti writers from all over Copenhagen and the suburbs would congregate, and a small posse of Hip Hop DJs would cut up Electro and Rap tracks as well as breakbeats, to which breakdancers would battle. The DJ posse around Thomas P. Hejle had already gotten into the Beastie Boys’ early releases on Def Jam, and of course Run-DMC were onto something as well with ‘Rock Box’ and ‘King Of Rock’, but the rock hybrid had not yet materialized into anything with a broader appeal. I had actually seen Beastie Boys perform at the Danceteria in New York back in 1985, where they shared an evening with Jazzy Jay and Whodini, and I liked the gritty style of their early Def Jam releases, but I didn’t really feel much for the crossover tracks that followed ‘You Gotta Fight for Your Right to Party’, and which pretty much gave us Caucasians carte blanche to launch our own strain of Hip Hop. From the very little TV coverage that exists, it looks like there was an electric atmosphere at Thomas P. Hejle. What was it like spinning there? How did the nights go down? Those nights were always interesting, and you really had to earn your credentials as a Hip Hop DJ and stay on edge to maintain your hard-won reputation. In that sense, the early Hip Hop scene in Denmark reflected the US scene quite faithfully in terms of rivalry, and that included dancers, painters, rappers and of course the DJs. 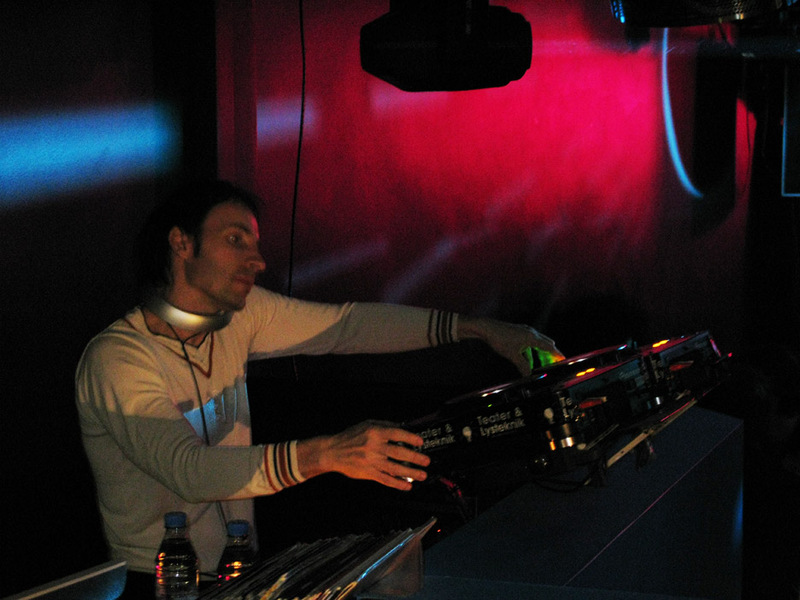 A typical night would have a few warm-up DJs showing up early at the DJ booth to practice their skills. They would be followed by the A-listers – Phase 5, DJ Duke and yours truly – whom would come on and share the evening between them with 30-60 minute segments each. That wouldn’t leave you much space to build up the mood in the room, and all DJs would be throwing their aces from the get-go of their slot. The barometer of your skill would be the dancefloor, and it would always be a goal to get the breakers to throw down. As the concept evolved, rappers got involved, and groups were created, so the turntables were moved to the stage, where DJs could back up the rappers and showcase their scratch skills as well. The DJing element, scratching and cutting took on its own life, and the scene became extremely contested. Towards the end you’d have DJs with serious skills take to the stage. That was where DJs and producers such as Soulshock and Cutfather made their early claims to fame. And they developed world-class skills! The rivalry among the DJ posse around Thomas P. Hejle spread into the DMC national mixing competitions, and within a short timespan you had DJs from all the suburbs showing up to battle. Some of the second and third wave of Danish Hip Hop DJs – Knud, Uggerløse etc. – were essentially prototype turntablists and took the artform to a different level altogether. Looking back at that period, I can safely claim, that it was the unique environment at Thomas P. Hejle, which gave rise to the extreme competitiveness and high skill-level of the world-class DJs that cut their teeth – so to speak – behind the wheels of steel there. However, what is even more important to consider, I feel, is that we did far more than just play and create music at Thomas P. Hejle. The full movement, which formed the scene, included both DJs, rappers, producers, writers, dancers and painters, and what we did in fact create there was culture! Prior to that, Denmark didn’t really have a scene for Hip Hop including both rapping, breaking, grafitti and turntablism, all of which is now widespread and with talent popping up and being cultivated throughout the nation. You were also an active battle DJ back then, competing in the DMC contests, which people took very serious. I once heard a rumour saying, that you cheated in a battle by attaching a homemade transformer switch to the mixer and covering it with your jacket or something. Was that true? Haha, nope, I never cheated in those contests. In fact, I kept things extremely clear in view. I would even spray a record with liquid gas and set it on fire in one particular battle, so there was no way, I could even let a jacket get near that, haha. What a crazy rumour! There was this thing, that we did, though: When we started pushing the envelope with regards to scratching, and needed quicker fader movement, we figured out, that we could stick a small sheet of plastic in between one channel’s headphone output selector switch and the cavity wall, while routing that output to a different channel. That way we could use the headphone selector button as an on/off-switch, which was much faster than using the faders, which would be flying off all the time. Sometimes the output button would jam, though, and it could be crazy hard to get the small plastic sheet out again, so that the mixer could be used in a normal fashion. It would have been awesome to have a dedicated switch, though. In ’94, after ‘Dope Material’, you made the instrumental Hip Hop EP ‘The 4 Boroughs’, which is now pretty rare. How did that come about? And why did you want to make instrumental Hip Hop? What many people refer to as ‘The Golden Era’ of Hip Hop, wasn’t really that golden for me. Frankly, Hip Hop started to bore me around ’88, when it got really commercial, and I found it increasingly hard to identify with the ideals, which the genre was creating. It was only, when the scene in New York switched gears around ’93, and real grit came back into Hip Hop, when groups like Wu-Tang Clan stepped up, that I began to find it interesting again. In my own opinion, the international music scene was in a flux between ‘88 and ’93, when production equipment became more accessible. While some styles became more generic, this increased accessibility also gave birth to more off-springs of the various genres, under which musical works were generally categorized. Mind you, there were nuggets here and there, especially in R’N’B, but it was only House music, which developed in a direction, that truly appealed to me, and where the DJ was still relevant. I wasn’t content with just making House tracks, though, and I found, that I could actually still make Hip Hop tracks under the guise of a genre referred to as Jeep Beats, which was a genre getting some underground traction at the time. The vocal content on those tracks were samples used in the same type of repetitive arrangements, which you’d find on underground House tracks, so it wasn’t a very big leap for me to just drop the tempo and focus more on ‘the boom’. What became of that record? I only heard about it recently, when I was snooping around for more info on Dose Material. That record was pretty underground. I’d admit that anytime, but it got a fair bit of airplay on mixshows and made me a little pocket money as well. What actually became of it? I don’t know, because I didn’t really keep track of my releases back then. The Danish Hip Hop- and R’N’B-label Solid Productions made some noise in the late ’80s and early ’90s, both in and outside Denmark. Were there ever plans for you to work together, or did you focus on doing your own thing? I had already been working with Soulshock and Dr. Jam (producers at Solid Productions), and I was in talks with Willer, the manager of Solid Productions, at the time. We were in New York to meet with some rap groups, and at some point Willer and I got into an argument, that got a little heated, and that kind of ended that relationship. We never really got back to discussing any sort of collaboration after that. Haha. You have also made lots of House and Dance records, as well as re-edits and megamixes. What has been your biggest passion? Well, claiming that I’ve made ‘lots of Dance records’ would perhaps be stretching the truth a bit. ‘Dance’ – if we could agree to define it as the commercial strain of Euro-house – had zero appeal for me, so I stayed well clear of that genre. I would agree, that I made quite a few House records, though. House was definitely my biggest passion, and it still is, because it is one of the few genres, that has the capacity to hold equal amounts soul and grit together in an uptempo framework. On a personal level, I find it far easier to identify with House, because the rhythmic framework allows for so many interpretations and excursions into various soundscapes. House as an artform even took on a social function, to bring egality to the small communities, which formed in and outside of particular clubs. Not unlike Hip Hop in the early days. So while House was originally an expression of double-exclusion – black and gay – it also became instrumental in gathering communions in their own sphere with its own soundtrack and dance styles, which were beyond the reach of comprehension of mainstream pundits. The mainstream crowd quickly realized the exclusivity factor of the underground movement(s), as it swept clubs first, then airwaves internationally, and soon membership of those almost tribal movements became a priced asset – if not the source of envy for the general community, whom suddenly took the role of the ‘excluded ones’. Both House and Hip Hop exist today, and both in a variety of forms, but for some reason, mainstream media has chosen to interpret House as ‘EDM’. Although the term ‘EDM’ – or Electronic Dance Music – is meant to define a genre, it somehow misses the point: To begin with, EDM is an extremely vague term for a multitude of genres, which under that definition only exists with the common and primary purpose to get people to dance to pieces produced to fit under that banner. The problem with this, is that each genre under, what is at best an umbrella-term, are highly idiomatic, with their own types of instrumentation and arrangements, which do not necessarily lend well to other genres, and therefor the term loses significance. It’s interesting, isn’t it, just how much that label ‘EDM’ itself sounds very similar to the word ‘idiom’? However clear the logic may be, both the artist contingency and the audience appear to get confused in their labelling of individual productions. Hip Hop doesn’t seem to suffer quite so much, and it probably is the most popular style of music today, influencing genres and even fashion across the board. Arguably, House music itself is highly idiomatic with its formulaic rhythmic structures, soundscapes and arrangements. Those traits define the genre and its many off-springs, and even more so these days. In recent years, many tracks appear to adhere to a minimalist mindset, as they are centred around standard arrangements with simple vocal samples looped or sprayed onto generic patterns and layered with predictable effect sounds, ‘wooshes’ and ‘swishes’ taking the place of harmonic elements to build tension and anticipation perhaps at the expense of melodic content and – dare I say – relevance? For me, EDM is, at best, an odd moniker. It’s essentially synecdochic. Consider that, most music produced since the mid-to-late seventies is characterized by a dominant presence of instruments driven by electricity to run those electronic circuits, that have enabled artists to produce the wonderful sounds of some of the most legendary recordings of our time, and many of which have found their way into Hip Hop sets and productions to form the basis of great Rap records as well as House tracks. For me, a record must have a rough beat, along with at least a chord-progression or bassline to keep things driving, and that should be underpinned by some sort of vocal performance with ‘soul’ and a contextual relevance in it. It can be as simple as using a sample from another record or an entire song in a traditional structure, but there must be something there. The extremely simple off-beat basslines and predictable chord progressions sprinkled with nonsensical vocal themes, which you’d hear on so many Dance records for the better part of a decade, made it impossible for me to grant the genre that stamp of quality approval, which would allow it into my sets. The art of editing – as showcased on countless Latin Freestyle records – continues to inspire me. That genre had a lot of exciting moments in the mid-‘80’s, when some truly groundbreaking productions brought out great compositions and vocal performances. That was the genre, where on the b-sides you’d find the dub-versions with ‘trick-edits’, which were basically de/re-constructions of the structure and rhythms of the main version. Those dub-versions were to Latin Freestyle, what special effects were to the Star Wars franchise. This was where technological prowess and sheer craftsmanship was taken to its extreme limits. It was also a scene, that was definitely easier for me to identify with. For a while at least, before the genre got inflated, and the quality of compositions degraded, House was ’where the money was at’, so the genre (Latin Freestyle) slowly morphed into House, albeit without the excellent vocal performances, that would define the classics of the genre. As it turned out, House was perfectly capable of sustaining itself, and there has been some amazing records over the years. I would be the first to agree that Soul, Disco, Gospel and Electro gave us House, and as it turns out, it is the gift that keeps on giving. Which of your own productions are you the most proud of and why? As for my own releases, I’d probably rate ‘Dancing’ and ‘We All Need Love’, which I released under the guise of Casa Royale, as my most accomplished works, but the stuff, I released as Klubhead and on Cutting, is also right up there. Those records brought together all the elements and production values referred to in as good a balance, as I was able to achieve at the time. That said, it’s been a while, since I’ve really listened to my own stuff, but that’s the feeling, I recall having, when they were released. I understand that you live in China now. Are you still making music? Anything in the works for the fans to look forward to? Yes, I realized, that I had fulfilled my ambitions in music in the early 2000s, and that culminated back in 2008, when I was awarded the Kim Schumacher Prize by the Danish DJ community. Seriously, I cannot thank them enough for that honour!!! At that time I had enrolled in The Asian Studies Programme at Copenhagen Business School to pursue a degree in International Business Administration to try out a whole new type of career. In China. And lo and behold: Here I am! When I’m not doing corporate stuff, I do actually play around with music, and I have been fooling around with a couple of concepts, that may turn into actual productions one day. If nothing else, to prove, that it’s not everything, that comes out of China, that’s of terrible quality. What do you like to listen to yourself nowadays? Anything you’d like to recommend? These days I listen to both Hip Hop and House. I even do mix sets every now and then, which I post online. I do those mixes mostly to satisfy my own appetite for building sets with awesome tracks seamlessly sequenced to create the musical exhilaration, I don’t really find anywhere out there. I also do listen to a lot of other stuff including Alt Rock, Dubstep, D&B, R’N’B, vintage Northern Soul, Ska, Reggae and many more genres. There is a lot of great stuff out there, and with the Internet the world is at your fingertips! Would I recommend anything in particular..? Well, musical taste is so subjective, you know, so my best recommendation to people out there looking for great music is: Seek and you shall find! Thanks again for your time. Best of luck in the future. Same to you, and thank you so much for your interest! Special thanks to DJ Sugi and Slick Nick for the contact and music. Extra shout out to Sketzh for the help and Carsten Willer for the images. Jesper Jensen is a Copenhagen-based writer, documentary filmmaker and rap connoisseur. “My material’s dope” was insanely inspiring to danish hip hop producers/DJs at the time. The record still sounds good to this day too.